June 2014. Don’t remember who ordered it. Twin Peaks is one of the most famous and influential TV-shows of all time. Member of the pantheon of “gone too soon”. You all know the premise. You recognize the images, you know the catchphrases. Its iconic Black Lodge and Red Room remain one of the most mysterious elements of the series — the ones where series creator David Lynch would let loose his restrains and let his artistic self to run amok drowning the viewer in the intense flow of dense surreal images. 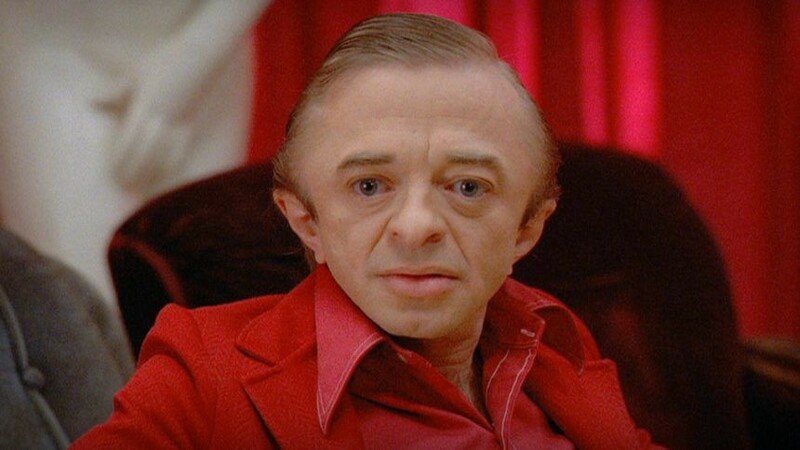 One of its most curious characters from the Red Room was Man from Another Place played by Michael J. Anderson. A little impish person who spoke in riddles backwards and always was few steps behind the protagonists. His dances and the way he spoke quickly became a series calling card for the series’ utter weirdness. In the real world — speaking backwards is mostly a joking anti-language novelty used to prevent people from outside to understand something and thus make fun of them. In the series — it is a dialect of the Black Lodge which is possibly from another dimension. Usually it is not used as it is but rather as a modification of already existing recording. But for the Twin Peaks — instead simply turning the recording backwards Michael J. Anderson suggested that they should really speak backwards. The basic idea was to reconstruct sentences from the end to the beginning turning every word in an opposite direction. This little trick makes them sound almost recognizable but weird in the same time. You get the notion that it sounds familiar but you can’t dig it. Technically speaking — it is not a hard thing to do. There are two ways of doing backwards speech. First is to do reversal according to the phonetic structure of the words. Second is to do the reversal according to the spelling of the words. In short sentences — it sounds silly and cute. But the bigger structures you transform — the more bizarre and alien it starts to sound. For example, let’s take Gertrude Stein: “Five words in a line”. It turns into “Enil a ni sdrow evif”. Sounds like a magic spell from fantasy novel. Or let’s try something more bizarre — William Carlos Williams’ This is Just to Say (with some adjustments to make it easier to pronounce): “d-loc os dne / teews os / suo-iciled erew yeth / em evigrof / tsaf-kaerb rof / gnivas / ylba-borp erew you / ch-eew dne / ksob-sigh eth / ni erew taht / smulp eth / netae evah i”. You get the point. Michael J. Anderson had recorded a short reverse speech master-class with the most famous phrases from the series for the 2001 DVD release of the first season. Watch it below.